On day the Sun-god, Apollo, sent his pet raven down to Earth to bring the thirsty god a cup of fresh water. Apollo's sacred raven was not a very dependable bird. On arriving at the spring the raven saw that a fig tree was just beginning to bear fruit. "What matter if I wait only a few days until the fruit ripens?" the raven asked itself. And it waited. When the fruit ripened the raven then stayed several more days eating the fruit until it was all gone. He then filled the cup with fresh spring water but realized that his master would be angry for the long delay. Then he noticed a water-serpent nearby and grasped it in his claws. So with cup in mouth and serpent dangling from his claws, the raven flew up to Heaven. He explained to Apollo that the serpent had attacked him and that is what caused the delay. Apollo was not taken in by the lie. And he was so angry with the bird that he flung him, cup and serpent out of Heaven. Today we see them together in the sky as Crater, the Cup, and Corvus, the Raven, perched on the serpent's back. This myth gave rise to two alternate manes for Corvus as a constellation: Avis Ficarius, or "the Fig Bird," and Emansor, or "One Who Lingers Too Long." The Many-Headed Monster or the Serpent. 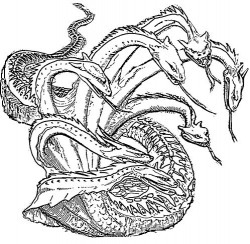 The swamps of Lerna was home of the Hydra, an enormous water snake with nine heads (one of which was immortal), and with breath that would kill on contact. With the help of Athene, Hercules located the monster's lair, and the ensuing struggle was a standoff. When one head was sliced off, another appeared in its place. Hercules solved this problem by using a torch to cauterize each stump after he cut off that head. Then at Hydra's plea, a giant crab emerged from the swamp and bit into Hercules' foot. Hercules promptly killed the crab and then cut off the Hydra's immortal head and placed under a huge stone where it could do no more harm. He then dipped his arrows in the Hydra's blood. The slightest scratch from one of these arrows would bring instant death to his enemies. Hydra Barrier is the Water Serpent that can protect your home and everything in it. Get the multi headed water serpent working to protect your most valuable asset. Other things to help around your house.